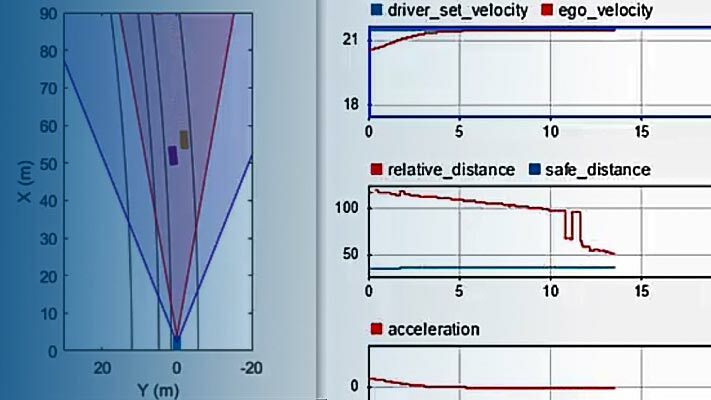 This example shows how to construct a monocular camera sensor simulation capable of lane boundary and vehicle detections. The sensor will report these detections in vehicle coordinate system. 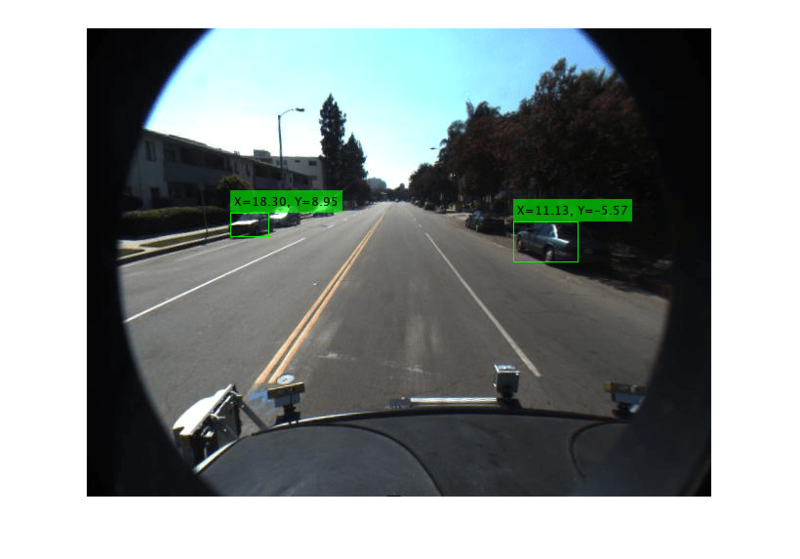 In this example, you will learn about the coordinate system used by Automated Driving Toolbox™, and computer vision techniques involved in the design of a sample monocular camera sensor. Subsequently, the readings returned by a monocular camera sensor can be used to issue lane departure warnings, collision warnings, or to design a lane keep assist control system. In conjunction with other sensors, it can also be used to implement an emergency braking system and other safety-critical features. The example implements a subset of features found on a fully developed monocular camera system. It detects lane boundaries and backs of vehicles, and reports their locations in the vehicle coordinate system. Knowing the camera's intrinsic and extrinsic calibration parameters is critical to accurate conversion between pixel and vehicle coordinates. Start by defining the camera's intrinsic parameters. The parameters below were determined earlier using a camera calibration procedure that used a checkerboard calibration pattern. You can use the Camera Calibrator app to obtain them for your camera. Note that the lens distortion coefficients were ignored, because there is little distortion in the data. The parameters are stored in a cameraIntrinsics object. Next, define the camera orientation with respect to the vehicle's chassis. You will use this information to establish camera extrinsics that define the position of the 3-D camera coordinate system with respect to the vehicle coordinate system. The above quantities can be derived from the rotation and translation matrices returned by the extrinsics function. Pitch specifies the tilt of the camera from the horizontal position. For the camera used in this example, the roll and yaw of the sensor are both zero. The entire configuration defining the intrinsics and extrinsics is stored in the monoCamera object. 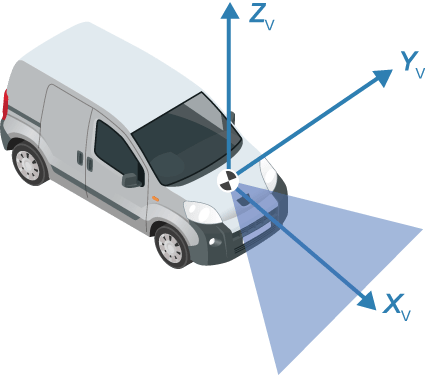 Note that the monoCamera object sets up a very specific vehicle coordinate system, where the X-axis points forward from the vehicle, the Y-axis points to the left of the vehicle, and the Z-axis points up from the ground. By default, the origin of the coordinate system is on the ground, directly below the camera center defined by the camera's focal point. The origin can be moved by using the monoCamera property of the monoCamera object. 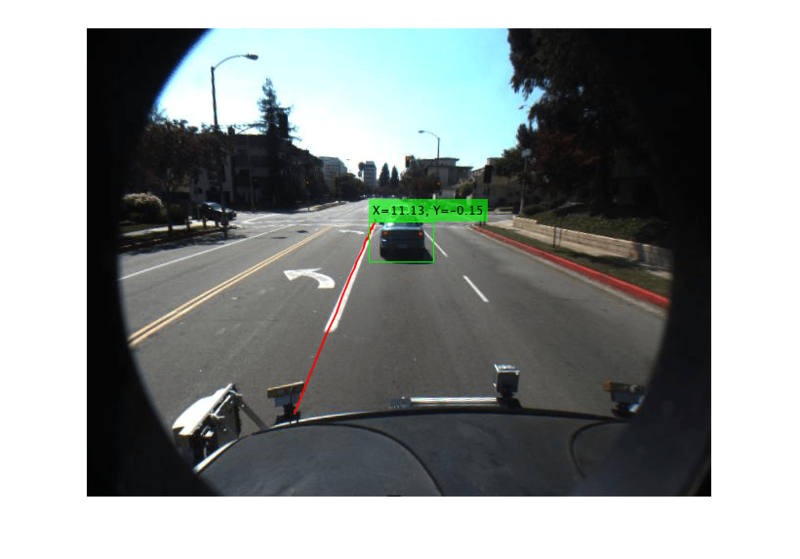 Additionally, monoCamera provides imageToVehicle and vehicleToImage methods for converting between image and vehicle coordinate systems. Note: The conversion between the coordinate systems assumes a flat road. It is based on establishing a homography matrix that maps locations on the imaging plane to locations on the road surface. Nonflat roads introduce errors in distance computations, especially at locations that are far from the vehicle. Before processing the entire video, process a single video frame to illustrate the concepts involved in the design of a monocular camera sensor. Start by creating a VideoReader object that opens a video file. To be memory efficient, VideoReader loads one video frame at a time. Read an interesting frame that contains lane markers and a vehicle. 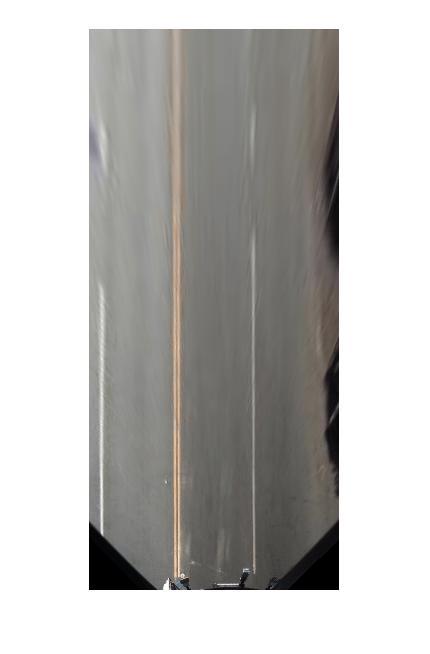 Note: This example ignores lens distortion. If you were concerned about errors in distance measurements introduced by the lens distortion, at this point you would use the undistortImage function to remove the lens distortion. There are many ways to segment and detect lane markers. One approach involves the use of a bird's-eye-view image transform. Although it incurs computational cost, this transform offers one major advantage. The lane markers in the bird's-eye view are of uniform thickness, thus simplifying the segmentation process. The lane markers belonging to the same lane also become parallel, thus making further analysis easier. Given the camera setup, the birdsEyeView object transforms the original image to the bird's-eye view. This object lets you specify the area that you want to transform using vehicle coordinates. Note that the vehicle coordinate units were established by the monoCamera object, when the camera mounting height was specified in meters. For example, if the height was specified in millimeters, the rest of the simulation would use millimeters. The areas further away from the sensor are more blurry, due to having fewer pixels and thus requiring greater amount of interpolation. Note that you can complete the latter processing steps without use of the bird's-eye view, as long as you can locate lane boundary candidate pixels in vehicle coordinates. 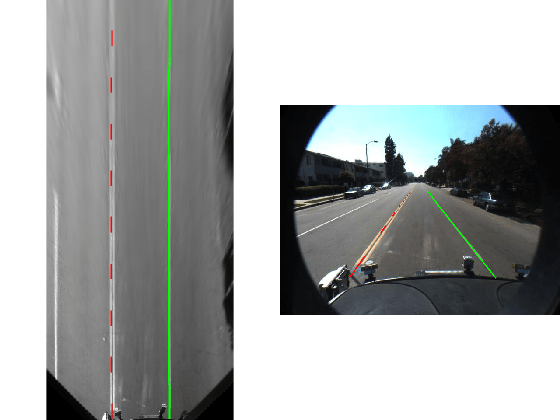 Having the bird's-eye-view image, you can now use the segmentLaneMarkerRidge function to separate lane marker candidate pixels from the road surface. This technique was chosen for its simplicity and relative effectiveness. Alternative segmentation techniques exist including semantic segmentation (deep learning) and steerable filters. You can substitute these techniques below to obtain a binary mask needed for the next stage. Most input parameters to the functions below are specified in world units, for example, the lane marker width fed into segmentLaneMarkerRidge. The use of world units allows you to easily try new sensors, even when the input image size changes. This is very important to making the design more robust and flexible with respect to changing camera hardware and handling varying standards across many countries. Locating individual lane markers takes place in vehicle coordinates that are anchored to the camera sensor. This example uses a parabolic lane boundary model, ax^2 + bx + c, to represent the lane markers. Other representations, such as a third-degree polynomial or splines, are possible. 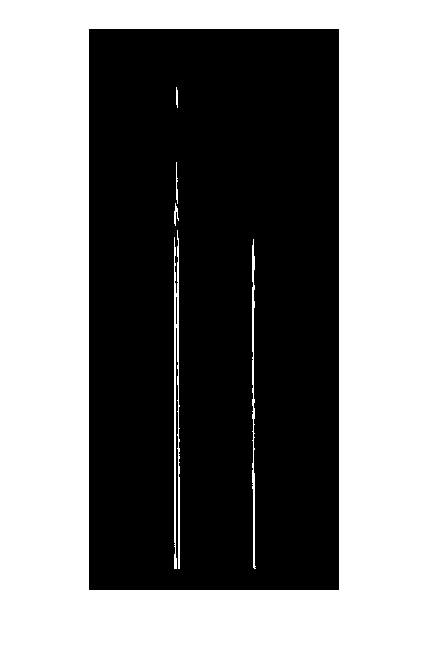 Conversion to vehicle coordinates is necessary, otherwise lane marker curvature cannot be properly represented by a parabola while it is affected by a perspective distortion. The lane model holds for lane markers along a vehicle's path. Lane markers going across the path or road signs painted on the asphalt are rejected. Since the segmented points contain many outliers that are not part of the actual lane markers, use the robust curve fitting algorithm based on random sample consensus (RANSAC). Return the boundaries and their parabola parameters (a, b, c) in an array of parabolicLaneBoundary objects, boundaries. Notice that the findParabolicLaneBoundaries takes a function handle, validateBoundaryFcn. This example function is listed at the end of this example. Using this additional input lets you reject some curves based on the values of the a, b, c parameters. It can also be used to take advantage of temporal information over a series of frames by constraining future a, b, c values based on previous video frames. Some of the curves found in the previous step might still be invalid. For example, when a curve is fit into crosswalk markers. Use additional heuristics to reject many such curves. Remove additional boundaries based on the strength metric computed by the findParabolicLaneBoundaries function. Set a lane strength threshold based on ROI and image size. The heuristics to classify lane marker type as solid/dashed are included in a helper function listed at the bottom of this example. Knowing the lane marker type is critical for steering the vehicle automatically. For example, crossing a solid marker is prohibited. Show the detected lane markers in the bird's-eye-view image and in the regular view. Detecting and tracking vehicles is critical in front collision warning (FCW) and autonomous emergency braking (AEB) systems. Load an aggregate channel features (ACF) detector that is pretrained to detect the front and rear of vehicles. A detector like this can handle scenarios where issuing a collision warning is important. It is not sufficient, for example, for detecting a vehicle traveling across a road in front of the ego vehicle. Use the configureDetectorMonoCamera function to specialize the generic ACF detector to take into account the geometry of the typical automotive application. By passing in this camera configuration, this new detector searches only for vehicles along the road's surface, because there is no point searching for vehicles high above the vanishing point. This saves computational time and reduces the number of false positives. Because this example shows how to process only a single frame for demonstration purposes, you cannot apply tracking on top of the raw detections. The addition of tracking makes the results of returning vehicle locations more robust, because even when the vehicle is partly occluded, the tracker continues to return the vehicle's location. For more information, see the Track Multiple Vehicles Using a Camera example. Next, convert vehicle detections to vehicle coordinates. The computeVehicleLocations function, included at the end of this example, calculates the location of a vehicle in vehicle coordinates given a bounding box returned by a detection algorithm in image coordinates. It returns the center location of the bottom of the bounding box in vehicle coordinates. Because we are using a monocular camera sensor and a simple homography, only distances along the surface of the road can be computed accurately. Computation of an arbitrary location in 3-D space requires use of stereo camera or another sensor capable of triangulation. Now that you have an idea about the inner workings of the individual steps, let's put them together and apply them to a video sequence where we can also take advantage of temporal information. Rewind the video to the beginning, and then process the video. The code below is shortened because all the key parameters were defined in the previous steps. Here, the parameters are used without further explanation. % sensor outputs into a struct. Display the video frame. Snapshot is taken at timeStamp seconds. The helperMonoSensor class assembles the setup and all the necessary steps to simulate the monocular camera sensor into a complete package that can be applied to any video. Since most parameters used by the sensor design are based on world units, the design is robust to changes in camera parameters, including the image size. Note that the code inside the helperMonoSensor class is different from the loop in the previous section, which was used to illustrate basic concepts. Besides providing a new video, you must supply a camera configuration corresponding to that video. The process is shown here. Try it on your own videos. Create the helperMonoSensor object and apply it to the video. % vehicle detections with higher scores. 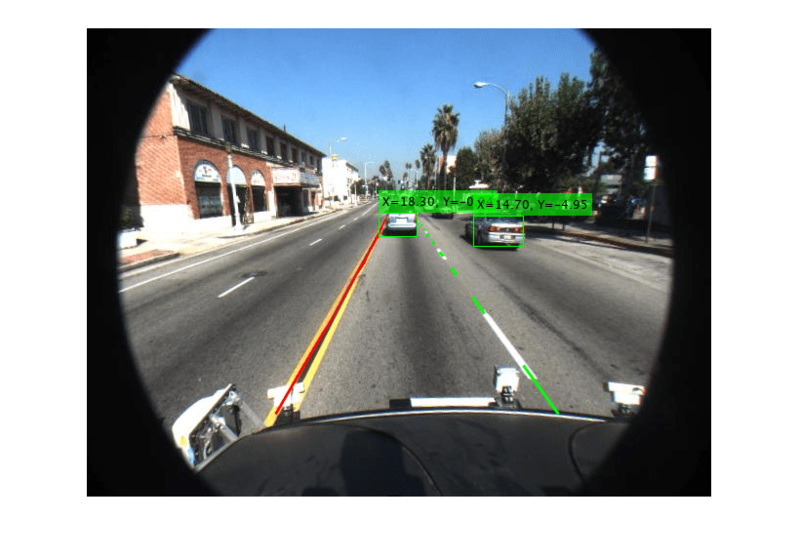 visualizeSensorResults displays core information and intermediate results from the monocular camera sensor simulation. computeVehicleLocations calculates the location of a vehicle in vehicle coordinates, given a bounding box returned by a detection algorithm in image coordinates. It returns the center location of the bottom of the bounding box in vehicle coordinates. Because a monocular camera sensor and a simple homography are used, only distances along the surface of the road can be computed. Computation of an arbitrary location in 3-D space requires use of a stereo camera or another sensor capable of triangulation. % image coordinates, where [x,y] represents upper-left corner. insertVehicleDetections inserts bounding boxes and displays [x,y] locations corresponding to returned vehicle detections. vehicleToImageROI converts ROI in vehicle coordinates to image coordinates in bird's-eye-view image. validateBoundaryFcn rejects some of the lane boundary curves computed using the RANSAC algorithm. classifyLaneTypes determines lane marker types as solid, dashed, etc. % on that unless you know that the ROI extent includes at least 3 dashes. takeSnapshot captures the output for the HTML publishing report.